HAPPY HALLOWEEN.....Just a quick note to let you know I received the box, I got it on Tuesday 26 Oct. Look for a note from me in the mail too. I love the cards as always and am glad to know it's my last one, but will miss getting them. Maybe I'll have time to make my own cards when I get home.....we shall see. Take care and keep doing the wonderful things you are doing for the deployed military members. Thank you very much for supporting those of us who are down range. I took one of your cards that say "missing you" on the front with a butterfly. We look forward to the once a month delivery of the cards at the post office. It doesn't take long for all the cards to be selected. Everyone back home comments on the beautiful cards. We appreciate your support every day. Bless you! I am currently deployed to FOB Rushmore, Sharana district, Afghanistan. We have a Chaplain's "free store" here on the FOB. I went into the store the other day and found a whole box of these wonderful, creative and fun handmade cards. I told lots of the other Soldiers about it and we looted the box. :) I just wanted to say thank you and tell everyone how grateful I am that so many peope take the time to make cards and send them to Soldiers. The cards truly put a smile on my face, as well as many others. Thank you for all you guys do, it is very much appreciated. Tiny photos - big thanks! Thank you for sending another box of cards, I will be on the look out for them. I would like some Valentine's Day cards but not until January. We don't have a lot of room here to store things so it is better to wait on that. Please share the photos and my thanks with everyone involved! Sorry for the delay in thanking you for the AWESOME box of cards!! They are being put to good use! We really appreciate your support and kindness. We're amazed at how great your cards look! Wow - thanks! PS Sure...we'll take some Christmas cards! I'm a seabee member from NMCB 18. Today I've seen the BIG box of cads that you sent to us. The cards are well-made and very pretty! We're definitely getting cheered and feel very delighted to have this gift from you guys. Thank you so much for the love and support!" We got the box of cards with a wonderful Thansgiving collection. 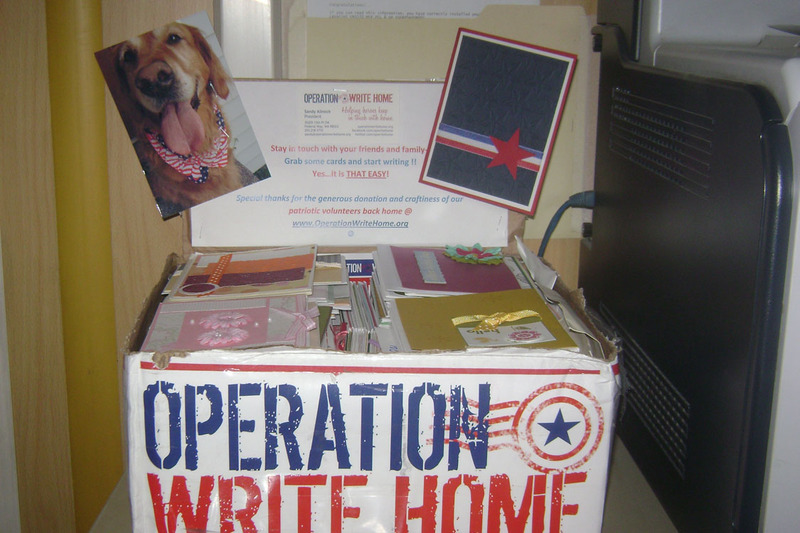 Dixie, I have so many of our troops who have started writing home now b/c of the cards. Your volunteers who do this wonderful service should witness what I see here, the magic that these boxes of cards bring to the troops. We have all found out that we will for sure be here through Christmas. But we are actually excited to know we have a Christmas box coming our way. Cardmaker Wendy P. of Harrisburg, NC got this nice email from a hero! Wendy always writes several Hero notes when she makes cards. What a nice response she got today! impact that you have on the lives of so many people. We received the box of greeting cards today and I am overwhelmed by the out pouring of support from your team of extraordinary card makers! I am so excited to share these with our team to encourage them to stay in touch with their loved ones back home which can sometimes be a bit of a challenge. These cards will help tear down the barriers to communication and help us reachout to those who mean the most---family and friends. Please extend our heartfelt appreciation for this wonderful gift, their spirit of volunteerism, and unwaivering support for the men and women serving overseas. May God continue to bless your life in the same meaningful and fulfilling way that you have blessed ours today. And yes...Ciara is famous once again! Your dog pics crack me up! Ciara loves getting fan mail...LOL! We received the box of cards in the mail the other day. As always, they are beautiful. I had to grab some for myself to send to fam and friends. Tell your coworker I said thanks for the magazines. * I'm always getting ideas on how to save or improve what I am already working on. Your dog pics crack me up! If it were a picture of my cats, they would be laying on top of the boxes. Our Noel can't resist wallowing all over our mail or jumping into boxes, hampers, and empty bags. One time I was sorting through a ton of papers to file (while sitting on the floor), and Noel kept playing and messing up my piles. Talk about one crazy cat! Abby doesn't do that. Instead she sits on your chest at 0530 and stares at you til you wake up and let her out. If you don't let her out she moves to the nightstand and starts knocking things off (miss attitude!) Talk about hilarious. Well I have to run! Thanks again for everything. *This hero is planning a wedding for when her deployment is over - so we sent her mags. We received the box of cards you sent and on behalf of the CSH, I thank you and the ladies for the time, effort, and expense that went into these magnificent cards. They were all snatched up quickly and we look forward to the next batch. Thank you so very much for the support that you show to our Armed Forces. We here with the Alpha Troop really appreciate all of the cards we have received. Times have been very hard for us lately so it has been very good to be able to write home. We have recently moved and we are just getting settled in. Word is that we will be ending our combat operaiton in January though we probably won't be home until March but I don't think we will need anything after the New Year. Thank you and everyone else for all that you do. I really wish I could write more but I just got back from a 4 day mission that was just terrible. We are in recovery right now and I'm exhausted. Take care and know that we are so very appreciative. I just wanted to send you a quick thank you email. I received the box of cards today. They are incredible. I've written so many cards today alone. The art of writing a hand written note has truly been lost. Thanks to you and your organization for reviving it again (at least for me). I plan on cherry picking the cards I like best and then distributing the rest among my friends. Thanks again. Your cards will go to good use. I reached in and grabbed a few random cards to send out and I came up with yours. I hope this reaches you and that I typed the right e-mail. Thanks for the thoughts. I will share this with others. I have been at a FOB in the Arghandab Province for over two months. I am now back at KAF. Again,,,,thanks! I apologize for not getting this to you earlier. We received a box from you a few days ago! Thank you so much for getting that together. I know every letter in the hero mail was read and is displayed at our help desk. I know that the box was scoured by many members of my unit and letters are being sent home as I write this ... We do not have an American Post Exchange, so to have something like this sent to us is pretty exciting. We're a group of Americans (Air Force, Army, Navy and some Coast Guard) with coalition forces. time it isn't possible. I will try to gain approval from my command to take some pictures to send to you. Thank you again, and have a great day! thank you so much for all that you do! It's well-appreciated! Thank you for sending me the card. I really needed those words of encouragement. I am currently deployed to Iraq with the 224th Sustainment Brigade from Long Beach, CA. We have been here since May 2010. I really appreciate you all thinking of us. Cards don't get "call dropped"
I recently saw an amazing greeting card on the community shelf in the day area of our barracks here in Kabul, Afghanistan. I write home to my wife and kids every day and have since my deployment began over six months ago. It has become one of the most important ways to stay connected, even more so than the emails and phone calls. Cards are personalized and tangible and persistent. They don't hang up, get "call dropped" or depend upon a weak internet signal. In fact, for the lack of cards in our particular area, I've been making my own. I draw on 3 x 5 cards and tape them together, then write my message in the inside and stuff in any envelope I can find. You can bet when I saw an OWH card up for grabs, I was on it! That is just an amazing card. Okay, it was a Valentine's Day card, and it is October, but I made it work and was elated to do so. On the back was a website where I got this email address. 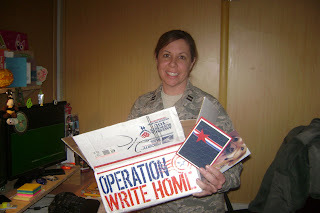 How would I go about requesting some cards for our troops (and me) to use to write home to our loved ones. We have about 225 soldiers, airmen, sailors and marines in our unit that would love to have some for the upcoming holidays. Thank you for all you and your organization do to support us while we are distant from our loved ones. These things you do are the things that really make a difference for our morale and keep us connected in a way modern means cannot. Thank you again. ***ETA: Yes, this unit is getting the next box that goes out, no worries! Just wanted you to know that I received a box of cards from you a couple of days ago. They are a big hit with all the soldiers in my unit. We appreciate all that you and the others at Operation Write Home do to help us stay in touch with our loved ones back home. Several of us scrapbook and we will be sending cards your way for other soldiers when we finally arrive home. Thanks again for donating your time and talent to our service members deployed overseas! I've been meaning to email you. I'm one of those service members who utilize the cards that you and so many others make for us to send home to our families. They are absolutely adorable and very much appreciated. I love the selection. I have children so I really appreciate being able to find something for them that they can enjoy as well. I felt it very necessary to give back to those that are so willing to give to us for what we do and sacrifice. Thank you again for your generosity and to all the volunteers who put their effort and time into allowing us to reach back home. Thank you very much for sending us more cards! It's amazing how much of an impact that last box had. You are the only one to have sent cards and it is amazing. As I wrote you the first time I also wrote Hallmark a letter. I explained to them where we are and that we have nothing. After your first box arrived I finally received a letter from Hallmark saying in a polite way, "we already help out the Army." Totally cool and understandable. It hit me even more right then because while a miltimilliondollar company said I can't, Operation Write Home and yourself not only said you can, but said what more can we do! That's just really cool to me. About needing a full box or mix*, I would say a mix because I want to make sure everyone else you are helping get some too. We appreciate all you sned no matter the size, you make us all smile. I must be going, thank you so much for being so kind to us. You are really such a morale booster to all of us. *We asked how many Christmas cards they wanted to get - half box, full box, etc. How sweet that they want to share with everyone - but guess what? These guys get an extra box just for being so sweet!! They sent a photo, but I can't scan it quite yet. I'll add it when I am able, and let you know on FB when it's posted! Thanks for the Hero Mail! hero. We love you and thank you for supporting us. I received a box of cards today. Thank you very much. Everybody is enjoying them so much and they are all going pretty fast (specially the Thanksgiving ones). I was wondering if we can have 2 boxes for Christmas so I can put one at the hospital and keep one here at the chapel. If you are unable we understand. Thanks again for what you guys do for us. met with strong praises for their creativeness and workmanship. Once again thank you for all of the support. Sandy, "Thank you" sincerely doesn't seem enough, especially with all the time, talnet, and materials put into every card. Because of your organization, LTC W, Chief N, and I will be able to personally thank each of our troops in a very personal way this Halloween, while also wishing them a "Happy Halloween!" Thanks for making this request a reality. You and "Operation Write Home" are appreciated. May the Lord bless you for blessing others. Thanks so much for the cards and the time you and everyone else took to pack them. I just received another box full of wonderful cards. I appreciate your offer to send two for Christmas and I think that would be perfect. I know that will be a hard time for many of my troops to be away from family but your cards will help alleviate that separation. We received your wonderful cards! Thanks so much. We all love them and are excited to see the Christmas cards too. We are a Combat Stress Control Unit spread out over many locations throughout Iraq. We shared the cards with the Soldiers that come to our clinic locations also. If you are able to send us another full box, they go quickly around here and we send some to our other locations also. We are grateful for the time it takes all your volunteers to make the cards. You are all truly talented. OWH Halloween Party in Kuwait! As soon as we opened the box and could see how beautiful the cards were we knew that we had to do more than just stick them on a shelf and let people wait until the last minute to send them home, so we held a Operation Write Home Greeting Card event! We had a day where we displayed all of the cards and let service men and women come in and take a few and write home to their loved ones. We had treats, drinks, decorated the office, and even had a “mail box” where they could drop them off and we took them over to the post office! The event was such a hit that even our pet volunteer Lance stopped by all dressed up! Thank you so much Operation Write Home and all of the people involved with your organization. The cards have already brought smiles to the faces of those here in Kuwait and will bring more smiles once they make it to the families mail boxes! We received your box of cards today! I am happy to say the box is half gone and it has only been 6 hours. The cards are so cute and adorable. Thank you so much for all the love and work that went into this box. I write home often and I am still amazed that cousins, aunts, friends, and love ones that I do not talk to often at home write me here! I have rekindled many relationships and shared stories about my experience here through cards like these. With all the technology we have....there is something you cannot replace about a handwritten card or letter from a person that cares. I would like to thank you for your generosity and support. This morning when I was at the chapel here at Camp Leatherneck in Afghanistan I found a number of Halloween cards. I had just spoken to one of the doctors about what his daughters were planning to dress up as for Halloween. I gave him a card for each of his daughters and then took a couple to send to my nieces and nephews. I know they will be excited to receive the cards. Thank you all that you do. I consider myself very fortunate to be the beneficiary of your thoughtfulness. As far as me participating when I get home! I am a consultant for Close To My Heart Scrap booking. The other girls in my unit will probably be interested also. When my son was in Iraq we all made cards just like you all do for him and his platoon not knowing about your group. We had a blast and we loved it. So I will go ahead and pass your information on to them and they can start now if they would like. By the way I forgot to tell you that I absolutely love your dog (mascot). Give him a pat on the head from me. I just received the box of cards about 2 days ago. Everyone in my office is extremely grateful for the opportunities to stay in touch, that the cards represent. And not just U.S. military. We serve with military members from a number of other nations. Several of those folks have asked me about the cards and why you do what you do. Each time I explain what your organization does and why, each person is touched by your efforts and the concern of the American people for their service members overseas. Although most of these card will be used by U.S. military members, a fair number of these cards will find their way to France and possibly to Spain and Turkey. And maybe other nations as I pass the box around. We are deeply appreciative of your efforts and look forward to the Thanksgiving and Christmas cards you mentioned in your card. As a warning, letter/cards can take up to 3 weeks to get through, so if you could send them to arrive by late October/early November, that would be great. If not, we'll be truly appreciative just the same. Thanks again for what you do. Your organization has made a lot of people very happy and excited. I just wanted to thank you for the beautiful card you made. I truly appreciate your time and effort. These cards mean more than you will ever know; and I am so happy that I get to share them with my friends and family. I just received my box of cards this past week and being a scrapbooker myself absolutely loved every card. I just sent out 16 cards today! Anyway your card said to let you know if I wanted a box with holiday cards, so I'm writing to say yes I will take the holiday box. There are plenty to share so my battle has also enjoyed them and I am so excited that we will be able to send Christmas cards now. I couldn't remember if I had sent you an email back yet requesting the additional box of cards so if for some reason you are not able to track this request and 2 boxes go out for me I will share them with the other soldiers in my unit. Thank you so much for putting a little color in our very brown world here in Iraq. When I get home I would love to participate by also making cards for the soldiers so I will keep your card until I get home next summer. I LOVED the box of cards, the Halloween ones were great. I also loved the fall cards, I'm using quite a few for Thanksgiving Cards. I can't wait until the box of Christmas cards come. I wanted to thank you again for everything you do and tell you that the Christmas box will be the last box you need to send to me. YAY!!!!! I have passed out all those cards you have to Soldiers who will still be here, our radio station is located in our building, so I hope that you hear from them. I will also pass the information on to the follow on unit in hopes they will use your wonderful gifts. We just received your box of cards for our detachment. Thank you so much! Your cards are much sought after and many of our troops were excited to see the new cards come through. I really liked the Halloween cards and picked up a couple to send to my son and nieces and nephews. Thank you also for the handwritten notes for the troops. We decided that they would be best for our patients. We’re planning on putting a note on each of the patient’s beds when they first arrive so they have something positive to think about as they recover. Once again, thank you so much!!! A fellow Navy Nurse passed your information on to me. I am a nurse here...working in the Contingency Aeromedical Staging Flight (CASF) with approximately 50 other team members. Our mission here is to provide medical care and a safe airlift for our wounded soldiers requiring higher levels of care. We would be glad to receive anything you can spare to assist us in keeping in touch back at home. We have been here since July 2010 and will remain on station until January 2010. Many are starting to feel homesick and I can truly say, we can use all that we can get to stay encouraged. Your assistance in this matter would be greatly appreciated. P.S. I am from Charleston, AFB and reside in North Charleston, SC. Take care and thanks again. you very much for doing that. I enjoy scrapbooking and making my own cards as well. They are much more personal than those you buy at the store. I had short notice to deploy and did not have time to make any extra to bring with me. Thank you again so very much for the time and effort you put into making these cards. I put the extra cards that people included to the soldiers in the women's bathroom and some of your cards* so I hope people will contact you for more cards for their units. it is so nice to have the stationary and I am really writing a card a day. Thank you so much as the cards are the most beautiful and are made with love. I know people will love receiving them too. Thank you so much for making handmade cards for the military . My son said he picked up one on a table at the USO in Kabul. He sent it to his father as a birthday card. Very meaningful especially as our 34 year old son and his father have had relationship difficulties. They are talking now but this was the first card he had sent his dad in more than 5 years. Words cannot express our gratitude. Wow Sandy - It's exciting all the interest in Operation Write Home. We received our box of cards today; we are so appreciative. Many, Many Thanks! I wanted to thank you for the boxes of cards. They are beautiful and express the high level of creativity of their creators. They "disappear" quickly and are shared with our loved ones back home. My soldiers, sailors and airmen all comment on the variety of the types of cards available. Again, thank you very very much for blessing us with these wonderful cards. Please pass the word of thanks & Praise/gratitude to all the wonderful generous and creative artists. Thanks for supporting us. My son (8 yrs old) asked me if I make these pretty cards I send home and he asked me if I could show him how to make them :) I told him that special people make thse cards for us to share with our family, friends and loved ones while we are away. He liked that and says he will try to make some cards to send to me. God bless you.